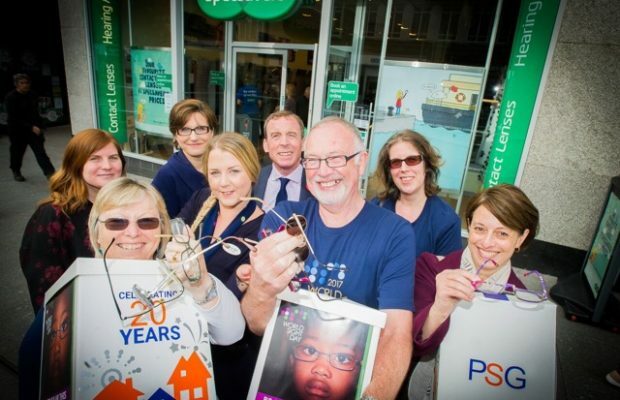 Last week, Property Search Group, the leading independent provider of conveyancing services in England and Wales, joined forces with South West law firms Foot Anstey, WBW and Kitsons to hand over unwanted glasses, collected for the Vision Aid Overseas World Sight Day campaign, to Specsavers. In celebration of October’s World Sight Day, PSG’s teams based in Swindon, Somerset and Plymouth visited law firms, from across the region, to collect old spectacles for recycling. The total number of specs collected amounted to just over 500 pairs. International charity Vision Aid Overseas recycles the donated glasses, and the income generated from the recycling process, is used to help build sustainable systems in more isolated communities across Africa. This includes building Vision Centres (equivalent to UK opticians), training eye care workers and supporting outreach clinics to deliver affordable eye care services. Elaine Connor at PSG Swindon said: “We started working with Vision Aid Overseas after hearing that just £5 provides a person in Africa with an eye test and a pair of glasses. Such a small amount to most people, but with a life changing impact. The glasses donated to VAO are hand sorted and then some specs are recycled for precious metals, whilst others are cleaned and sold on the charity’s EBay shop or to specialist dealers. Specsavers collects unwanted glasses, on behalf of Vision Aid Overseas and then sends them to the charity’s warehouse in Crawley.